A 15-year-old girl has been critically injured and 19 other people hurt as a double-decker London bus collided with two vehicles and hit a bus shelter. The bus collided with a car, a single-decker bus and hit a shelter at West Croydon bus station at about 12:20 GMT. The driver of the 198 Arriva double-decker bus was arrested on suspicion of driving under the influence of drugs. London Ambulance Service said 18 people were taken to hospital. 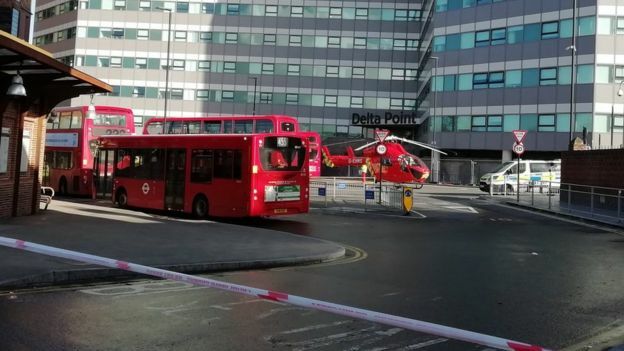 A Metropolitan Police spokesman said the 15-year-old girl had been a passenger on the bus and was taken to a south London hospital. Videos on social media showed dozens of emergency service workers at the scene. Graham Norton, assistant director of operations at the ambulance service, said it sent “a large number of staff” to the scene, including eight ambulance crews, a motorcycle paramedic, a hazardous area response team, paramedics and London’s Air Ambulance. “We treated a total of 20 patients at the scene, and 18 of these were then taken to hospital,” he said. An LFB spokesman said the two people who had been in the car were suffering from shock. A TfL spokesperson said: “We are aware of an incident involving a route 198 bus at West Croydon bus station.